This collection of more than 30 Cajun tunes is intended as a stepping stone for those who are new to the Cajun tradition. 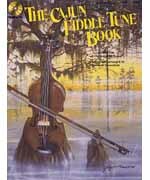 Because it's difficult to adequately capture the spicy, unique flavor of Cajun music in standard music notation, the specific notes and bowings in this book are but suggestions; the spirit in the music is quite infectious, and quickly you will find your toes tappin', your fingers flyin', and your bow dancing! Includes a list of sources for Cajun recordings, a discography, and a bio of arranger Deborah Greenblatt. Now with CD!